As promised, today’s blog update is about last weekend when my friend, Laura, visited us from London. Laura and I met when we worked at Ernst & Young Perth, Australia. It turned out we were both from Christchurch, New Zealand. Friendship ensued, we went our separate ways and technically now we are on the same continent again (even though Great Britain is an island, but you get my drift). Laura arrived late Friday night, so we picked her up (after getting routed through numerous tiny villages by our GPS and doing 180km on the autobahn) and had a quick catch up. It was then time for bed so we would be bright and happy for our road trip the next morning. Luxembourg is a small landlocked nation bordered by Germany, France and Belgium. We discovered they spoke French and Luxembourgish, and that there was also German and English widely spoken. Luxembourg has the highest per capita income in the world, which was reflected in the cleanliness, roads and shopping. We were quite surprised to see a lot of fake looking people, as is the case in any rich nation, it was just unexpected considering its location (cue over tanned, over made up, over dressed women everywhere). We arrived after getting stuck in a big traffic jam, and immediately (as always seems to be the case in my blogs) I needed a bathroom. The search was on! We waited outside a public one forever, but decided to search again. Desperation led us to a restaurant, so we decided to have lunch there. The food was great! Much better than we had had so far in Germany, and prices were reasonable. We then went and walked down to the area which we thought seemed to be most active as we drove through. It was very scenic! Everything seemed to be vibrantly green and there was a lot of pride in their country. As we had no definitive plans, we followed crowds. We ended up in a cute area where there was a market (I didn’t buy any tea cups though) and live music. Laura tipped an opera singer. We also had gelato, and Nick and I were so excited to find speculoos flavoured gelato! Speculoos is a ground up biscuit flavoured spread, kind of like Nutella but it tastes like biscuits. It’s delicious! And so was the gelato. We continued to wander around, and noticed that the patriotism also lead to an intense pride in their royal family. It was fun to see photos of their family, which seemed to be quite young, and Laura purchased a flag with the latest married off couple. It was hilarious! Alas, it was time to head home for taco night, which Nick cooked for us, and had some yarns over ciders to end the night. Rudesheim is about an hour’s drive away from us and it was a beautiful day for a drive! I struggled to find something for us to do on the Sunday as Germany closes down on Sunday for ‘family day’. Even the big cities close up shop! 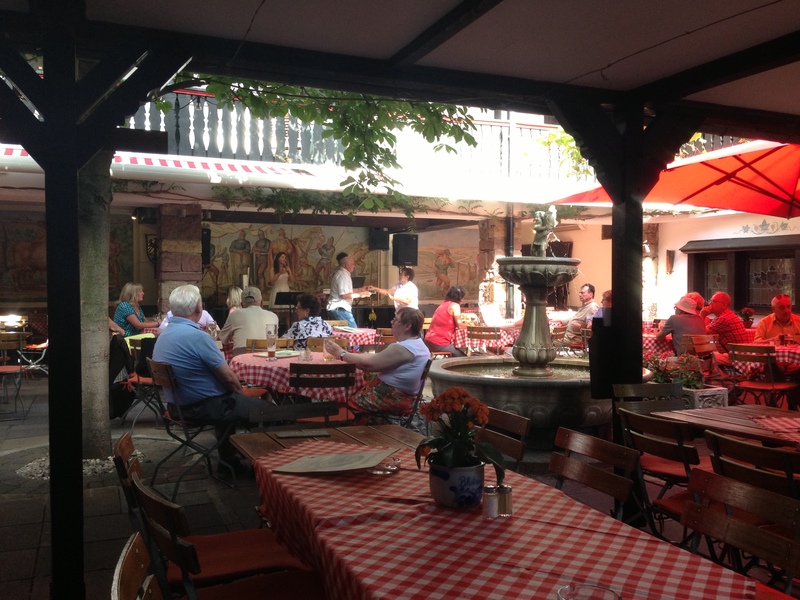 I found out that Rudesheim, being a tourist town, was open on Sunday. I had no idea what it would be like, but I’d heard it was a pretty wine making district. 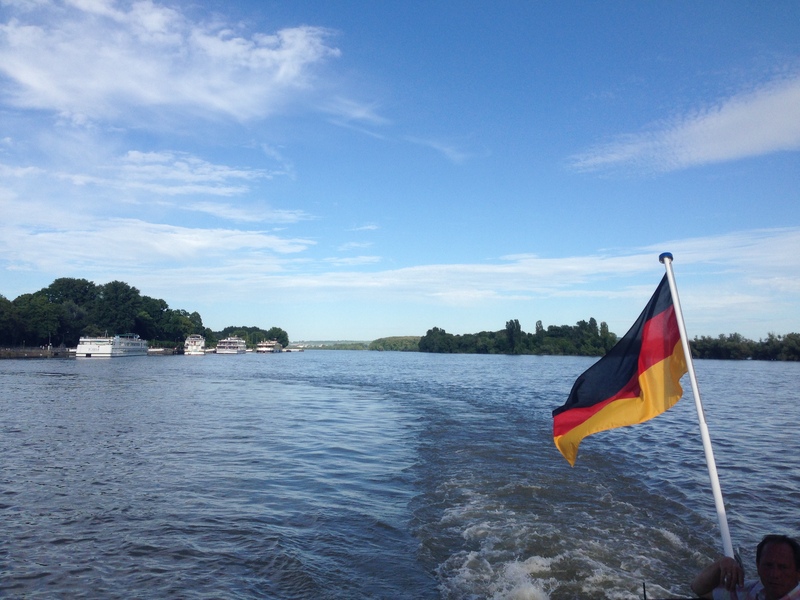 As we pulled up, we discovered that we had to take a ferry to get across to Rudesheim! (The GPS literally said ‘board ferry’.) Uhh, okay! Not quite so simple. We parked up and managed to find a passenger ferry and headed across to the other side of the Rhein. We wandered around, it was such a gorgeous little town and it had a wonderful atmosphere. I guess it felt like what you would imagine Germany to feel like – a true tourist town 😉 Nick and I tried a little delicacy. It seemed to be red wine, with something else, and fresh strawberries – kind of like a punch but with a strong wine kick. It was a nice refresher with the hot weather! We decided to take the gondola up the hill to the statues and for the view. At the top there were stunning views of the vineyards and the Rhein below. Nick and I want to go back and do one of the gondola tours that goes around to the nearby castle etc. On the way back I bought some gelato and we also bought some local liquor called Asbach which is brewed in the area. We haven’t actually tried it yet, but the local man sold it to us. It’s best served with coca cola, so I know I’ll enjoy it, but he said locals tend to just drink it straight with ice or in their coffee. We passed a small little Italian restaurant and they were playing live music. There was an elderly couple dancing to the music, seemingly so carefree and enjoying life. It was wonderful to see. There were many other older couples sitting watching them, taking in the sights and sounds, relaxing by the fountain that was making it’s own music of water gently rushing over its crevices. I turned and asked Nick if we would be like them when we grow old, and he turned and replied, ‘Of course!’. I couldn’t think of anyone better to live out my days with. We quickly caught the ferry back across to the car and then took Laura back to the airport. It was the end of her stay, and back to the UK she went. We will be seeing Laura again soon when we to a whirlwind (under 48 hour) tour to London in August.